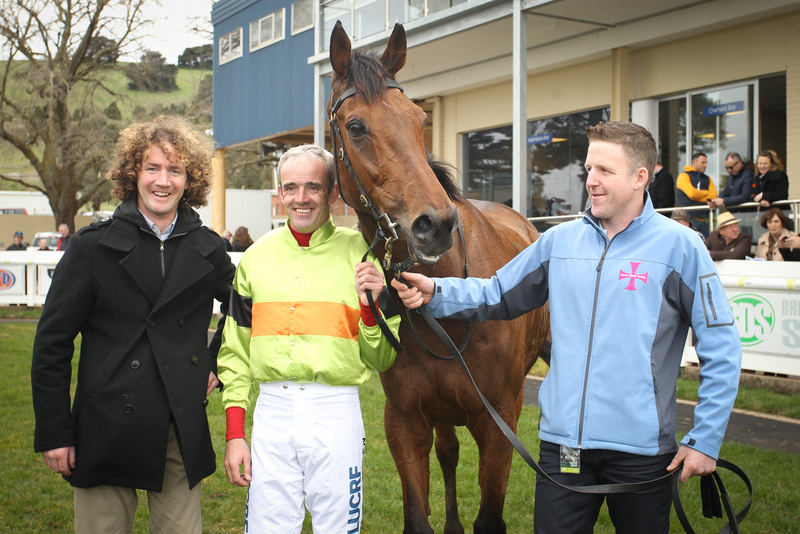 Ciaron Maher, Ruby Walsh, Bashboy and strapper after victory in the Australian Grand National. Pic: racing.com (Courtesy of GBR). Ruby Walsh created history when he won the Australian Grand National on topweight Bashboy on a whirlwind trip to Australia at the weekend. Walsh – a dual English and Irish Grand National winning jockey and the regular rider of Kauto Star – was offered the ride after Bashboy’s regular jockey Steven Pateman was suspended. Walsh delighted trainer Ciaron Maher and connections with a confident ride to secure victory in the 4500m contest in Ballarat, Victoria. Bashboy entered the record books as he is the first Australian horse to win three Grand National Steeplechases and also the first to win more than (AUS) $1million over jumps in Australia. The victory was even more remarkable as he carried 74.5kg, the highest weight carried to victory since 1957. Bashboy raced close to the pace before taking the lead 1800m from home. The contest developed in to a two-horse race at the top of the straight as Bashboy and Thubiaan drew well clear of the other runners. Thubiaan took a narrow lead but made a mistake at the second last. There was little to separate the two horses after the last fence before Bashboy gained a narrow advantage close to the finish. “What a horse,” said Walsh who was in Australia for little more than 48 hours. “I thought I still had a little bit left as we entered the straight. “I knew I was giving lots of weight away but I was jumping so good I couldn’t wait to get to the two fences. “The horse on my inside nearly fell at the second last and I nearly fell off but when I got him back on an even keel he started rallying going to the last and I knew I had a good show. Winning trainer Maher was full of praise for horse and rider after the victory in the (AUS) $250,000 contest. “I’m ecstatic – it’s unbelievable,” Maher said. “Full credit to Ruby – he’s just a true superstar. “Jumping the second last I thought we were going to run second again but the horse and him rallied. It was a true tough test and it was just a sensational effort. “It’s great for Australian jumps racing to get a rider of that calibre out here and for him to actually win the race – it’ll be international news. “The horse is just an outstanding horse. “I’ll probably never train (another) one like him – his toughness and his durability.